Last night I substituted for Ricky Carandang on his show The Big Picture, and the guest was Prospero Pichay who’d recently been in the news after expressing skepticism over Noynoy Aquino’s candidacy. His current position in the Local Water Utilities Administration has a fixed term, if I heard him correctly he still has three years to go in a five-year term, so he has security of tenure and will be around in government regardless of the outcome of the 2010 elections. He obviously relishes the role of being an agent provocateur. Pichay had some interesting things to say about the ruling coalition, its possible candidates, their survey ratings, and how they can translate their machinery into votes. Both on and off camera, he was consistent in saying that while the door remained open for the Vice-President, the real choice for the ruling coalition had narrowed down to two individuals: Defense Secretary Gilbert Teodoro Jr. and MMDA Chairman Bayani Fernando. He was more cagey about revealing his real feelings, if any, over widespread expectations that when the coalition’s directorate meets tomorrow, their choice will be Teodoro, long mentioned as the President’s personal preference as official standard-bearer. Today’s news all point to Teodoro being the choice of the coalition pooh-bahs and the president’s kith and kin. Ricky Carandang in his blog goes as far as saying the Vice-President has turned down overtures from the ruling coalition; it may be, the way Pichay dodged the question last night, that not everyone in the ruling coalition felt they should have kept the door open for the Veep for so long, particularly since he has studiously kept a standoffish position vis-a-vis their overtures. At least Teodoro proved himself a team player and signed on to the ruling coalition to make himself available for the party nomination. In that sense the green tarpaulin with the “Once and for all let us choose” slogan on it was a pointed barb against the factions angling for an accomodation with the Veep. While he served a purpose both in 2004 (removing a strong rival from contesting the presidency by convincing him to sign up with the President’s campaign), and since 2005 (in a sense, the Constitutional succession option was closed, because for far too many in the public, a de Castro presidency was a frightening possibility), the same reasons that made him politically useful in the past don’t necessarily make him politically desirable looking ahead to 2010. Teodoro has the one thing that no one else in PaLaKa can claim: despite being part of the Regime, he has never been accused of corruption. In other words, one of the most potent allegations against the Regime – its insatiable corruption – cannot be thrown personally at their candidate. Yes, one can say that he turned a blind eye, but its not the same as saying that he personally is corrupt. Its a distinction that will be enough for many undecided voters. Carandang also mentions that the ruling coalition’s machinery -“the backing of local political kingpins from Abra to Maguindanao”- is nothing to sneeze at. Which brings me back to Pichay. On one hand, I didn’t understand his claim that Teodoro was well-situated, because of his job, to gain credibility and exposure. The Defense department is as good a stepping-stone as any for the presidency; but his actual performance in that office aside, its vast opportunities for exposure and building good will -chiefly in terms of the Secretary of National Defense being the ex-officio Chairman of the National Disaster Coordinating Council- hasn’t translated into awareness or public support. He remains in the cellar, surveys-wise. It could mean, as Pichay suggested, that the public simply isn’t aware of what Teodoro has done; but it can also mean whether or not he’s done any good, he’s not getting any credit for it because he’s doing so by serving in the current administration. Anyway, Pichay says with enough money and an effective message, anything is possible, including a rapid and sustained rise in Teodoro’s numbers once he is anointed administration standard-bearer tomorrow. This is a way of telegraphing the built-in advantages of the ruling coalition: funds. Sources range from the formal to the informal, take your pick. the message might, indeed, be a comforting one for the coalition -“more of the same, but better”. Pichay also emphasized the administration’s advantage in command votes. He was unwilling to concede that overall, the administration experienced a debacle, nationally, in 2007; though he does concede too much of their time and resources was wasted by inter-faction squabbling on the local level during that campaign. He does seem confident they have ironed out those kinks and can present a united front going into 2010. What I found most interesting was his assertion that the administration has a solid 33% constituency, nationwide. The problem was, he said, was that constituency was sliced and diced in the senatorial polls, but that it will hold and deliver for a candidate for the presidency. With less than 1% in the surveys, this means Pichay expects Teodoro to rise 333% in the coming months, which will be a phenomenal achievement. To be sure, the Veep sidelining himself from the process, and possibly sliding down to contest the Vice-Presidency yet again or simply opting out of the race altogether, will mean a further realignment and a change in numbers for everyone, as the Veep’s constituency hunts around for someone else to support. To me this survey suggests that Aquino is taking votes away from all candidates, even those who are not necessarily hostile to the Arroyo regime. 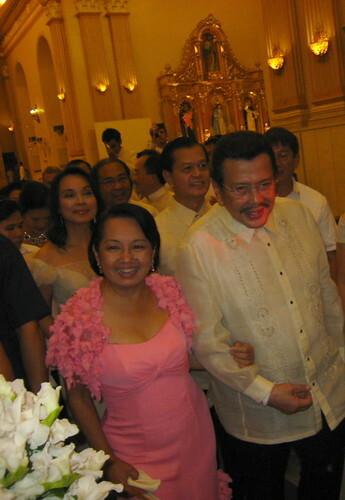 I expected Aquino, Escudero, and Estrada to divide the “opposition” vote, which was why Liberal Party leaders were worried that Estrada’s insistence that he run was meant as a spolier, to keep the vote divided and improve thew chances of the Administration candidate. But apparently neither Estrada nor Escudero have the numbers to be a threat. What’s more surprising though is the steep and sudden drop in De Castro’s numbers. His relatively high numbers in the past suggested to me that De Castro was not being tainted by his association with the Regime while at the same time, he seemed to be acceptable to Gloria loyalists. Inexplicably, Aquino seems to be drawing support from even from supporters of the Regime. If these numbers are sustained, you can logically expect Escudero to come to some kind of accomodation with Aquino, while Villar may start exploring a possible collaboration or alliance with the Regime, which seems to have written De Castro off and settled on Gilbert Teodoro. It all depends of course if the numbers hold and even improve. Escudero has half a month or so before he has to make up his mind about the presidency or the vice-presidency. My personal hunch is that if Carandang’s observations hold, then the political math, administration-speaking, is clear: Estrada would subtract from Aquino, while keeping open the door for a Teodoro-Villar alignment, whether formally (publicly) or informally (privately). Villar for one could maintain a nominal independence while the machinery of the ruling coalition could merrily subtract votes from everybody else even if it can’t make a difference for Teodoro, but might put Villar over the top. This assumes, of course, that from a Palace and ruling coalition point of view, they have less to fear from Villar (whose statements against Aquino have been tempered by his withholding fire from the President) while Villar himself faces the prospects of competing with Estrada for the same constituency. What’s even more uninteresting is why the ruling coalition felt it had to decide, now, on who their official candidate should be: it suggests things are less solid, or more brittle, than people like Pichay express in public. I forgot to add another interesting thing Pichay said during the interview. He mentioned that if Teodoro was selected as the party bet, then he could then be asked to resign from the Cabinet to focus, as Pichay put it, on the campaign and getting his message across to the voters. This would provide an opportunity for the President to put someone reliable in place who wouldn’t have scruples about maneuvering the armed forces to act in a partisan manner in the 2010 polls. Say, former AFP Chief of Staff Hermogenes Esperon, Jr.
November 30, the official filing of candidacies, or even February 2010, the actual official start of the campaign, would be good dates for this. Teodoro would evade accusations of using the Defense portfolio to help his campaign; but it would allow Camp Aguinaldo to help in the same manner it did in 2004. @KAIR: Why would it be SOP? Why would anyone voluntarily dig his own grave? Why would anyone (Gloria?) require him to? I think it doesn’t make sense. 2010 is not “all about choosing a leader who would at best replace her and reverse the misgovernance the Arroyo administration has done to the country for 8 years.” It is about choosing a LEADER. Period. Essentially, our Constitution is much flawed because its framers showed more concern with patching up possible leaks rather than in making the vehicle fit for our long journey ahead. Gloria a major factor in our choice? Yes, if we want to make the same mistake. Fortunately, we have such persons as SoP who shows interest in Gibo’s, in particular, platform. They would judge a candidate for what he is and for what he stands for, not with what others before him did. Would he be a tool of Gloria and her minions? Please. The presidency is not that cheap, nor is an elected President! It is not only the opposition who should watch out for GMA’S allies. It should be everyone’s concern. Unfortunately, I have yet to see anybody sounding the alarm. There’s me of course. Hehehe. I wish the Pilipinos will wake up in 2010 and basically “remodel” Malacanang, Congress and down to the lowest level of elective official. I don’t want an immune president. I want an anti-body, a proactive one. I think Noynoy showed that he is too civil to be a leader. His family thought it best not to bring Cory to a defiled Malacanang, but he allowed the defiler to come, albeit like a thief in the night. A firm request for her not to come would have been more civil and definitive. Which brings me to Carl’s concern about the possible implication of Noynoy’s and Mar’s peculiarity at so late an age which Manolo so cavalierly dismissed. Ex-Senator John O has had to deal with it. Methinks though that it is tolerable up to that level. Kung maaari lang sana sa Congress tayo ma-focused dahil naroon ang talagang problema. Saka pasensiya ka na kasi type ko si Gibo, e. Hehehe. not even thinly-disguised homophobia taxj. and worse aimed at people who aren’t even gay. If he doesn’t get married, will Noynoy be the first bachelor president in recent memory? Or ever? Chiz definitely does NOT have honesty and integrity! This is the same man who said he did not want to be Villar’s VP because of the C5 mess, saying something about his ‘conscience’ not accepting it, and that he is for good governance. And yet, Chiz Escudero remains an Erap apologist and loyalist. How does Chiz Escudero define’conscience’ and ‘good governance’ that Villar fails his standard while Erap passes? Chiz Escudero clearly has double standards and deny as much as he wants, is just your usual Trapo. Chiz, ipalaman sa basura, hwag sa Malacanang. I’m still a believer of Pilipino sayings. Pero mas matindi ang “Kung ano ang puno, siya ang bunga”.